If you want the base colour of your kitchen design to be neutral enough that you can work a seemingly endless selection of complimentary hues with it, but exciting enough that it will stand out in your home, then it looks like the Broadoak Partridge Grey could be the answer to your prayers. 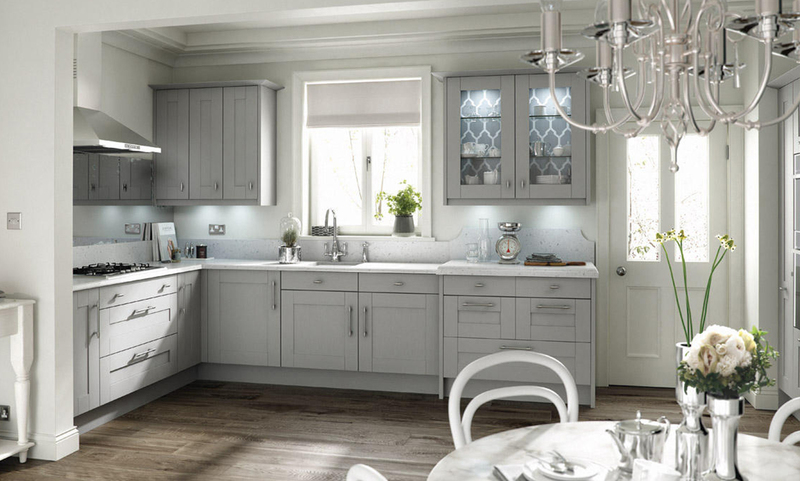 The classic shaker style Broadoak kitchen is shown here in the stunning contemporary partridge grey shade with is both neutral and striking at the same time. The classic shaker design creates a simple yet utterly effective kitchen space for your home. With sleek upper and lower cupboards, as well as a fabulous hob and cooker hood section, the Broadoak Partridge Grey is a kitchen worth talking about. Shown here is the Bianco Rivers work surface with waterfall edges, which creates a light and bright look that is perfect for the kitchen space. However, thanks to the versatility of the partridge grey hues in the Broadoak shaker, you can choose a kitchen surface in whichever shade or finish you like to accentuate your Broadoak Partridge Grey kitchen. Stainless steel handles are added to the kitchen cabinets to bring a real modern feel to the classic shaker style Broadoak kitchen. There are plenty of cabinets to house everything you could ever need, whilst keeping your kitchen clean at the very same time. Finished with a built-in sink area and a striking chrome faucet feature, you’ll find the end result of the Broadoak Partridge Grey to be utter perfection, perfectly catering for all of your kitchen needs. The classic shaker style Broadoak kitchen is just one of the gorgeous shaker kitchens available at Number One Kitchens. We operate a price match promise, which means you won’t find any of our kitchen solutions for cheaper anywhere on the web, but if you do – we’ll match it, no questions asked.